Best Tips for Increasing Your Google SEO Traffic by 2,041% in One Year! 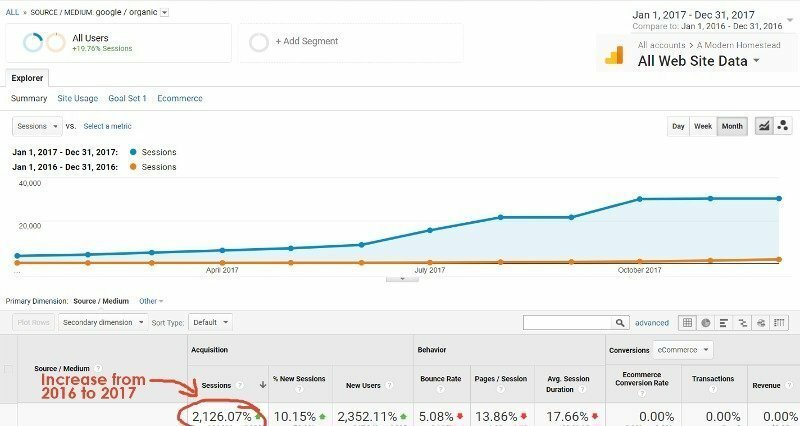 I was able to increase my organic traffic by over 2,000% this year by just implementing these best tips for increasing Google SEO traffic. Find out exactly how I did it, and you can too! SEO stands for Search Engine Optimization. You may or may not be familiar with the term, but just for the sake of being thorough, I’m going to explain this in full. The act of Search Engine Optimization as a blogger is the practice of increasing the quality and quantity of the traffic you have coming to your website through organic search engine results (aka Google, Bing, Yahoo…). Let’s look at each part of that definition! While you could write misleading or catchy titles to get people to click your links, if the content they find once they are on your site is not what they were looking for, they will click away and never come back. So what you want is to attract visitors who are genuinely interested in content that you offer. This also applies to writing content that is “off brand” for your site. If I write a viral post about make-up applicators it won’t do me much good in the long run because people would read that one post and then leave and never come back since my site is about simple living and homesteading! You want to make sure that you hook them with your quality on that first page (whatever page it happens to be) so they will visit again and again, and click through to more pages each time. As you continue to process content that gets (and keeps) people on your blog the amount of traffic Google will send you increases. You are then seen as a quality source for information and Google wants to send more people your way! Just look at what my SEO traffic has done in the last 2 years! My SEO traffic has gone from basically non-existent to over 40% of my monthly traffic! You can tell where I started working on SEO intentionally because the graph suddenly takes off! And the good news is, I only had to spend about 2 hours to optimize my whole site! After that, the maintenance on SEO is less than 2 minutes every time you write a new post. EASY! This refers to any NON-PAID traffic you get from search engines. Many people use Google AdWords to increase their ranking – in fact most links you see above the fold on a search results page are all paid. Increasing your SERP (search engine results page) ranking will help you get more organic traffic so you don’t have to pay for the hits! Now that you know what SEO is, you might be wondering why it matters. After all, you probably already see page views from organic traffic right? Well, while there are some posts you will naturally “rank” for in organic searches, implementing SEO practices will help you increase the number of posts you rank with… and the number of clicks you get from already ranking posts! For example: I have a post on how to cook a frozen chicken. One day I saw that I was getting a lot of hits on that post – much to my surprise since I had done zero SEO work on that page! When I simply went to Yoast (more on that later) and put in “how to cook a frozen chicken” in one of the fields, my page views on that post EXPLODED! It’s now one of my top 3 posts from organic traffic! Also, it’s very little effort to get going and yields high results. Last year I spent 2 hours working on my site to improve SEO and saw a 2,126% increase in traffic. Talk about worth the effort! Fortunately, even though the idea of SEO might seem a bit overwhelming, the process for improving your SEO is really very simple! Let me walk you through the exact steps I took to grow my organic traffic by over 2,000%! If you host your blog on WordPress, then the Yoast plugin makes the SEO process much easier! Go to your Plugins page >> Add New >> Search for Yoast. Install and activate that plugin first! I’ll tell you how to set it up on each post in just a few steps! Keywords is the word (or set of words) that you want Google to identify with your post. It’s the main idea of the content and can be a term you think people will most likely search for when looking for the content you are offering. For example: I wrote a post about how I was able to retire my husband with my blog and here’s how I went about choosing a keyphrase to set into Yoast. 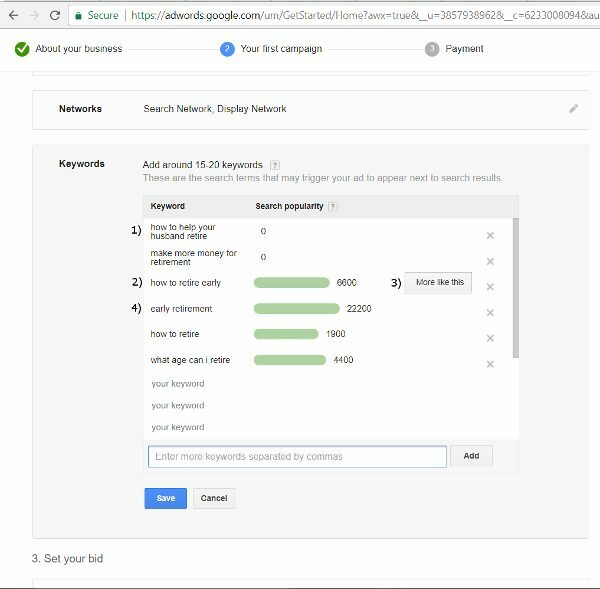 First I went over to the Google AdWords Keyword Planner (click Start Now >> Skip Guided Tour >> Save and Continue). 1. I started by typing in a phrase I thought might get searched for – “How to help my husband retire”. Big fat zero. So I tried again – “Make more money for retirement”. Again nothing! That number to the right of the phrase shows the average number of times that phrase is searched each month. 2. Tried again with something more generic – “how to retire early”. Much better with 6600 results! 3. Next I hovered over the line for my 3rd search and then clicked on “More like this” when it appeared. Google then populated similar phrases for me to choose from! 4. With over 20,000 searches each month I decided to target “early retirement”. 1. Does the keyword set really fit with my post or will people be confused when they visit my content? In this case it does! Early retirement can be achieved through blogging by anyone, anywhere in the world! 2. Will I be able to rank for the term? With 20,000 searches there is probably healthy competition for higher ranks, but not as much as a search term with 100,000+ searches. For example, it’s nearly impossible to rank highly for a term like “easy dinner recipes” which has 165,000 searches each month! 3. Does the term flow well within the post content? There’s nothing worse than having a search term just copied and pasted within a post 5+ times in a way that is completely unnatural. You’re on the last step now! Go into the post you want work with, and scroll down below the content section until you see the section call “Yoast SEO”. Once you’re there you will use the keyword you determined above to fill out the fields. 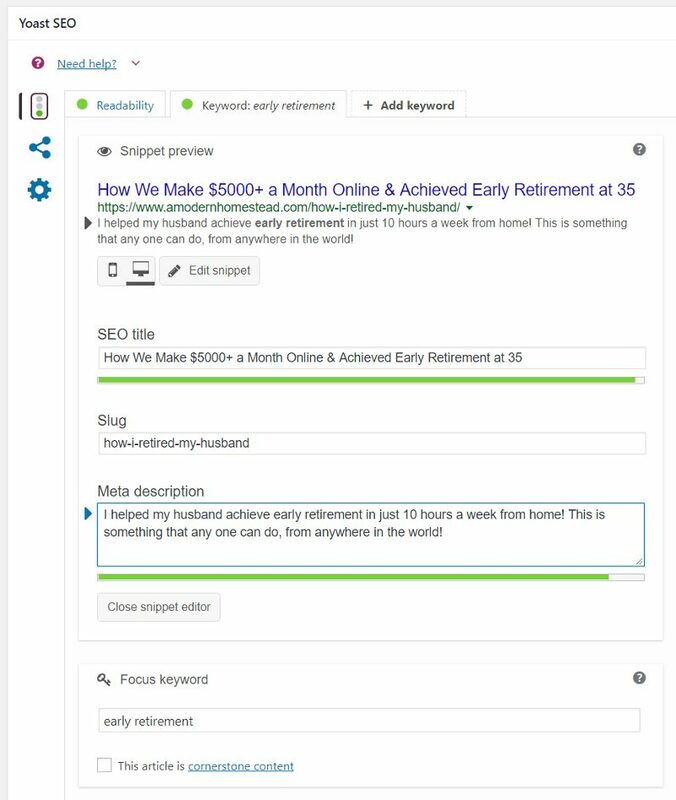 Here is out how I filled out my SEO sections for the early retirement keywords. 1. Click “Edit Snippet” to expand the Title and Meta Description sections. Fill them out with your keywords and make sure to use as much of the available characters as possible. Pick a title that is inciting and will cause people to want to read your post over any other one. Be sure not to make the title “click bait” that will cause people to click without having anything to do with the actual content of your post! For example: A title that says “You’ll never guess what this grandfather did when he found a hurt deer!” might get you to click, but when you find out all he did was take the deer to the local vet you will likely feel misled! The meta description needs to contain the keywords as well, but make sure they are not the first words or it will mirror the title and look boring. 2. Leave the slug alone. This is the URL for your post and is set when you write the post. Don’t change it, especially if the post was previously published. 4. Update or publish the post! Be sure to save the post like you would if you had made changes within the content. That’s it! You’re done! 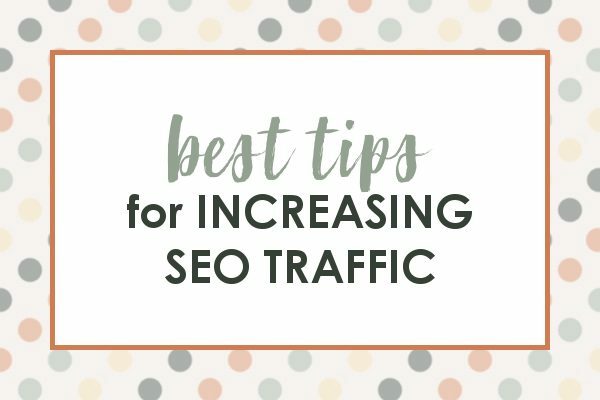 Now that you know my best tips for increasing Google SEO traffic you can implement these strategies for each new post (and all of your old ones) in just a few minutes per post! Previous Post: « Is Your Hosting Keeping Your Blog from Growing? Thank you so much for this post Victoria! I want to start implementing this as soon as possible. I’m having a bit of trouble with the Google AdWords instructions though. When I click your link then start it brings me to a login page and after that attempts have me set up an ad for sale. I’ve clicked around a few ways. What an I missing? Thank you so much for your help! Hey Christine! It took me about 2-3 months to really see the results. It’s a long wait, but it’s worth it! Thanks so much for all the great wisdom. I have availed myself to your information, and I have one question. For a niche website, mine is also homesteading, living simply, I post a lot of gluten-free, paleo info and recipes. I am finding that I may have too much of a two-niche clash between them. Should I focus on only one? My website is really struggling. Thank you so much. Hi Amy! You know, that’s a question I hear a lot, but it’s really a personal decision. I have homesteading and paleo posts on A Modern Homestead and it’s been fine. But I also started a Paleo/GAPS website to write about those diets exclusively. I with there was a hard and fast rule, but you just have to feel it out! Good luck!